ROYAL HUNT have so far preserved bringing on contradictual opininos regarding their 'lasting' repute. Even if they where considered to be the next 'big thing' in the 'experimenting' 90s - who can forget the huge success of collosal albums like Moving Target (1995) and Paradox (1997) - it seems that (in 'market' terms) the band lost credit after the departure of extraordinaire vocalist DC Cooper (now 'metal-ising up' with SILENT FORCE). 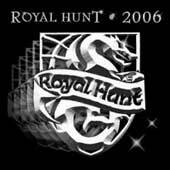 Still, I don't think ROYAL HUNT have (or can) ever deliver a less-than-good studio album in their portfolio; be it the unique charisma of mainman/creator Andre Andersen (is he really a 'stiff' persona?) in songwriting his way, the overall magnifivent pompous production 'dressings' or the - anyway - AORish enough voice of John West (ex-ARTENSION), this band keeps its personal pace and (personally speaking) correctly still scores enough respect (at least). ROYAL HUNT fans will like this live combo. It ensures the professionalism of this act plus it depicts the 'sonic' supremacy of Andre Andersen and Co. If the rest feel OK with this fact(s), go get the deal. Live 2006 is nothing less (or more) than a good release.